Earth Day, April 22, falls on the day after Easter this year. Why not celebrate the “low Sunday” after Easter as “Earth Sunday”? Here are some places to get ideas and resources. 35 Ways to Celebrate Earth Day 2019 — from Earth-Arbor Day, whose website has lots of other goodies for education and fun, especially with children. 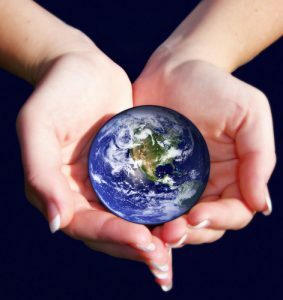 Earth Day Sunday Resources – good stuff from the Presbyterian Church (U.S.A.). Next Generation Rising: Earth Day 2019 – Every year Creation Justice Ministries issues a packet of resources centered around a theme. This year it’s Next Generation Rising, focusing on children and youth leading the way for creation justice. Check out their denomination-specific offerings. Let All Creation Praise – Here’s an ecumenical group that has links to all sorts of worship and educational materials. Earth Day Liturgy – from the National Council of Churches. Earth Day Sunday – The United Church of Canada. Unitarian Universalist Ministry for Earth – Here you’ll find an archive of materials, such as sermons and liturgies, from this year and the past. Blessed Earth offers a pdf of activities and worship aids for Honoring God’s Creation. Awakening to God’s Call to Earthkeeping: This is a great educational resource from the ELCA — a 50-page booklet with lots of ideas and lessons. Creation Care Curriculum: Every Creature Singing: Here’s a 13-lesson guide from the Mennonite Creation Care Network. Excellent!